You are here: Home / Deals / Estee Lauder Deal For St. Louis Mommies! Estee Lauder Deal For St. Louis Mommies! Hey all you St. Louis Mommies! Check out the Estee Lauder counter at West County Mall MACY’S! 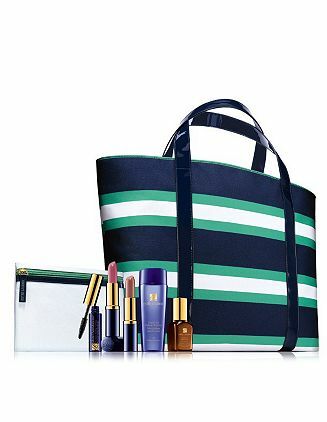 Right now Estee Lauder is offering their Free Gift with any $32.50 purchase of any skincare or foundation purchase! The Gift is their Summer Getaway Gift! It’s a striped beach tote with makeup bag, 14 day supply of Advanced Night Repair Serum,Gentle Eye Makeup Remover, Pure Color Long Lasting Lipstick in Pinkberry and Candy (Full-Size! ), and More Than Mascara in Black (The only kind I wear!). Me and the BFF are headed there Tuesday to make our purchases to get our Free Gift! This gift is available at all Macy’s for those of you that are not in St. Louis. Make sure that you hurry though because it ends July 5th! Pass this great info along to any women you know! Black Friday is Coming… Have Your List Ready With Plastic Jungle! Thanks for the scoop….I just got back from West County and stocked up on my fav perfume and received the free gift. I told "Cathy" that sippycupmom sent me and she gave me a 10 day foundation bottle and a quick eye touch-up! Thanks, Missy!